"Advice from an old tracker. If you want to find someone, use your eyes." To this day, the railway underpass on Richmond St., just north of York St. in London, Ontario is signed 4.0m. The legal height of a semi-trailer unit in Canada is 4.15m (13.6ft). 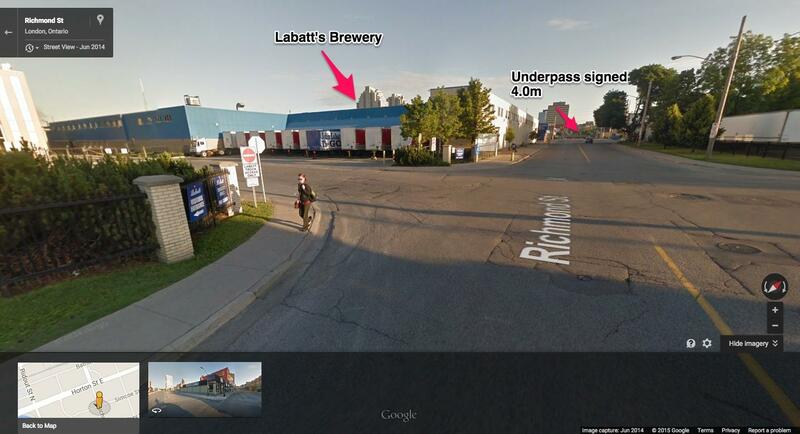 In light of that fact, Labatt's Beer Brewing Company is located just north of the tracks. Semi trucks move product in-and-out of the brewing company on a daily basis. In the first part of the century, I worked in London as a driving instructor. As part of students' training I brought them southbound along Richmond Street to practice shifting. When most students begin learning to drive truck, all other components of driving are eclipsed by the skills involved in shifting a non-synchromesh transmissions. "What's the legal height of the vehicle?" Some answered correctly, yet many couldn’t, even though the legal vehicle dimensions had been part of their knowledge test. As the student drove through the intersection I asked again about the unit’s height. 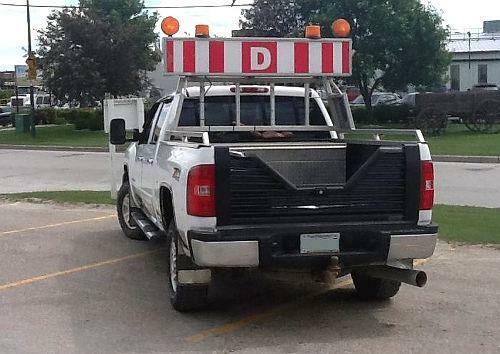 In my time at Ontario Truck Driving School, no student ever slowed. As they approached the underpass, the wind piled up in front of the truck and was forced back by the concrete underpass. The wind hammered the trailer’s aluminum roof with a huge WHUUUMP, just as the truck entered the underpass. In concert with the huge sound, I put my hands over my face, lowered my face to my knees and screamed! Unless your unit has an over-dimensional permit, the legal height of vehicles in Canada is 4.15m and 13’6” in the United States. If you do not know the height of your unit, measure it. This knowledge is pertinent for flat deck drivers where load heights can vary on a daily basis. For UHaul drivers and those with recreational vehicles it is imperative to know the height of your unit. The most common place to strike a fixed object is a fuel station; however, this hazard is less and less common as fuel stations are modernized and the height of the canopies raised. Still, this is the one obstacle that will "sneak up" on you. 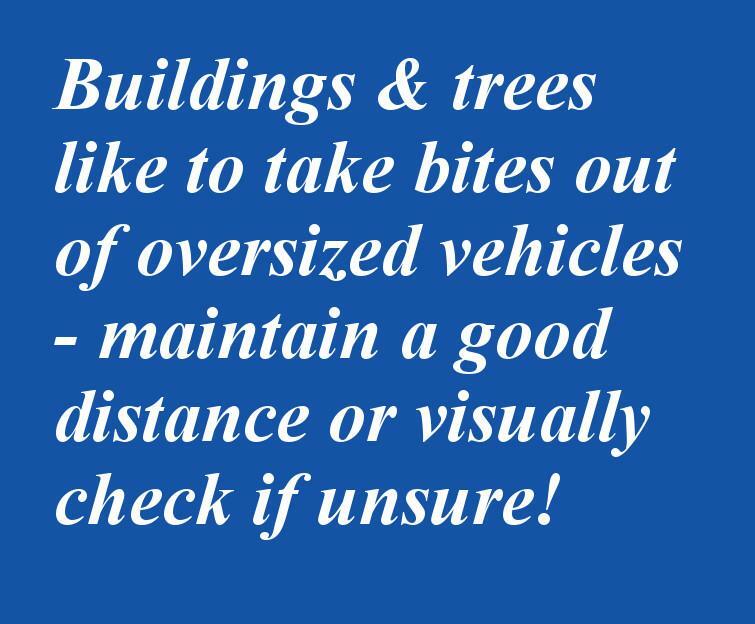 Remember, buildings and trees like to take bites out of oversized vehicles - keep a good distance, or visually check if unsure. Still, know the height of your vehicle and if you’re unsure, get out and look before driving under. When getting out to check, walk a significant distance from the unit to see clearly the height of your unit and the height of the fixed object. If you have acquired a permit to transport an over-dimensional load, the permit contains specific instructions. It will designate over-dimensional signs, flags, and lights. As well, the permit will designate routes and "times" during the day that the load can be transported. As well, whether pilot vehicles must accompany the load. Most over-dimensional loads are transported by companies that specialize in this kind of freight. 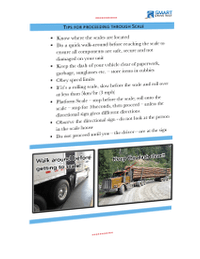 Support personnel are familiar with rules and regulations that the driver must adhere to be in compliance; yet, it is often not drivers of over-dimensional loads that strike a fixed overhead object. During my driving career in the 1990s, I delivered freight to the United States’ Eastern seaboard. A lot of freight was delivered in New York state where many height signs were measured from the centre of the wheel hub. Rather than being able to go under 13’6”, a semi-trailer could go under 12’6”. The first time I encountered a bridge labeled less than 13’6” in New York state was during morning rush hour. On the other side of the bridge was an industrial area, and the workers piled up on the roadway behind me as I sat there contemplating what to do. People began to honk. After 6 minutes, other drivers began to make their way around my rig. Moments later, a driver came up to the window of my rig and told me that I could go under the bridge. “Are you sure,” I asked? “Yes, trucks go under there all the time,” he replied. After thanking him, I put the truck in low gear and crept forward. At an extremely slow speed, I went under the bridge – the patron was right, I fit. I exhaled. In the months that I drove through New York State and north along interstate 87 from Brooklyn, NY east of Manhattan Island, I was never wholly comfortable with careening under overpasses signed 12’6” or 12’9”. And it seems that New York State still hasn’t rectified this problem. 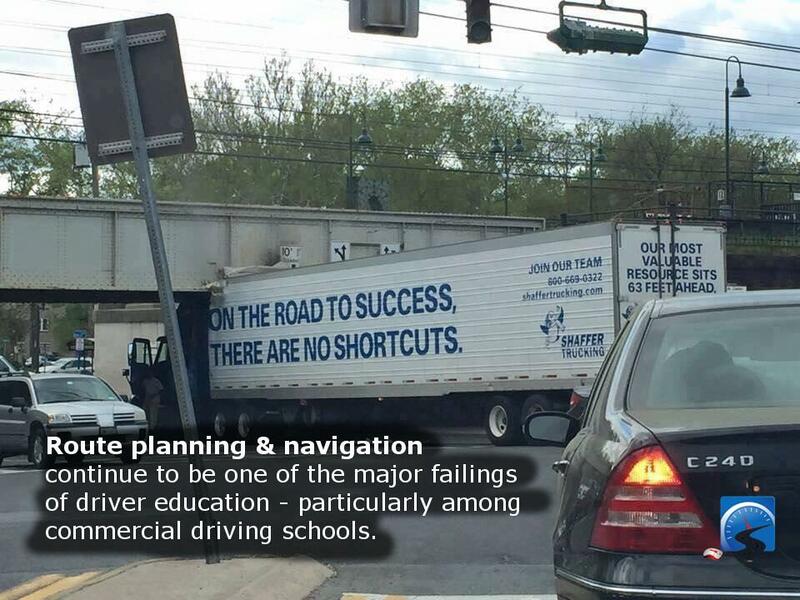 If you’re the least bit unsure of the overhead clearance, simply stop and figure out an alternative plan. If putting on the 4-way flashers and backing up to a place to where you can turn the unit around is not an option, than call the local police to help and assist. In the words of Capt. Malcolm Reynolds from the movie Serenity, “Advice from an old tracker. If you want to find someone, use your eyes.” NEVER TRUST A GPS UNIT!!! I cannot stress this point enough; always look out the windshield and read the sign. Local conditions can change at any point, and your GPS unit may not have the most up-to-date information, especially if you're using a generic GPS. When route planning, always consult at least two sources for directions. Never rely solely on your GPS unit. Truck driving stories abound of drivers receiving misinformation from online maps or GPS units. 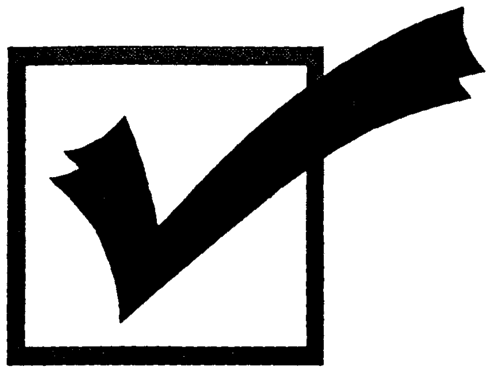 By calling the shipper, you can confirm your directions, and more important, the shipper will give you major landmarks that you can look for when navigating. On a trip to Boston in the 1990s, I delivered furniture to three different schools. At the first school, the woman in charge indicated that after unloading the chairs , I could follow her in her personal vehicle to the other schools. As a veteran driver, I impressed upon her the truck’s height. She had brought her adolescent son Jason to help unload the truck, and he would be riding in the car with his Mom. As we unloaded the truck we talk and joked about the truck being 13’6” and that it wouldn’t fit under anything less. We even made up a song. After unloading at the frist school, the drive to the other two schools went off without incident. As we unloaded the last of the chairs, a wrecker drove past pulling a truck and trailer. The damage to the top of cab and front of the trailer appeared extensive. For students that I trained in London, Ontario, I’m certain they never forgot the legal maximum height of a tractor-trailer unit. When they emerged from the underpass’ darkness and the noise had subsided; they looked to see me laughing uproariously. As I pointed to the Labatt’s Brewery sign: “Trucks go in their all the time. They dug out the underpass and never changed the sign,” I said. Some students cussed me in jest; others just smiled. It’s better that professional drivers learn the dimensions of their unit in a mock disaster rather than the real deal!